I first read 23 Things not long after it came out, years before George Marshall’s Don’t Even Think About It: Why Our Brains Are Wired to Ignore Climate Change. The latter discusses our inherently tribal nature and explains that no matter how reasonable your argument might be – how much evidence you present – if you are perceived as belonging to a different ‘tribe’ by those you are seeking to persuade, you are likely to fail. You would do better to get someone who is seen as belonging to that other tribe, or at least neutral – a ‘trusted communicator’ – to put your message across. I think at some level I already understood this at the time I read Ha-Joon Chang’s book. I saw him as someone I could use as a proxy ‘trusted communicator’ to put across the failings of the virulent neoliberal strain of capitalism, Dr Chang being an award-winning economist who has for years lectured in the subject at the University of Cambridge, which is surely as good a contender for the heart of the establishment as any. Ever since I read 23 Things, then, I have referred ‘capitalists’ to it, and it is recommended on my blog along with Bruce K. Alexander’s epic The Globalization of Addiction: A Study in Poverty of the Spirit (which explores how what Alexander calls ‘hypercapitalism’ is responsible for ‘psychosocial dislocation’ and thereby harmful substance and behavioural addictions), David Erdal’s Beyond the Corporation: Humanity Working (which shows how organisations can benefit from and reinforce the co-operative aspects of our essentially hunter-gatherer nature) and, needless to say, Wilkinson and Pickett’s The Spirit Level: Why Equality is Better for Everyone (which most readers will be familiar with). These diverse books, written by authors with very different backgrounds, complement each other and constitute a formidable arsenal to deploy against the dogma of neoliberalism and the unevidenced tenets of neoclassical economics (unfortunately ‘common-sense’ – and therefore easy to propagate – notions, relating to man’s supposed ineradicable inherent selfishness) on which it is based, and against the exclusive teaching of which university economics students have been protesting. Marshall’s book arguably completes the canon (of metaphorical cannons! ), explaining the relationship between neoliberalism and conservatism, and the fundamental importance of understanding our tribal nature (suggesting how to deploy the arsenal), but Chang’s is no less important, not only because he is potentially a ‘trusted communicator’, but also because of the convenient way he breaks down the claims made by advocates of neoliberal capitalism and sets out the evidence against them (providing an annotated catalogue of many of the weapons in the arsenal). So how does Chang explain the 23 Things They Don’t Tell You About Capitalism, and what are they? Need I point out how relevant this is to various recent developments? This is arguably as relevant to certain followers of the new-age spiritual movement as it is to free-market capitalists! ‘Over the last three decades, economists played an important role in creating the conditions of the 2008 crisis (and dozens of smaller financial crises that came before it since the early 1980s, such as the 1982 Third World debt crisis, the 1995 Mexican peso crisis, the 1997 Asia crisis and the 1998 Russian crisis) by providing theoretical justifications for financial deregulation and the unrestrained pursuit of short-term profits. More broadly, they advanced theories that justified the policies that have led to slower growth, higher inequality, heightened job insecurity and more frequent financial crises that have dogged the world in the last three decades (see Things 2, 6, 13 and 21). On top of that, they pushed for policies that weakened the prospects for long-term development in developing countries (see Things 7 and 11). In the rich countries, these economists encouraged people to overestimate the power of new technologies (see Thing 4), made people’s lives more unstable (see Thing 6), made them ignore the loss of national control over the economy (see Thing 8) and rendered them complacent about de-industrialization (see Thing 9). Moreover, they supplied arguments that insist that all those economic outcomes that many people find objectionable in the world – such as rising inequality (see Thing 13), sky-high executive salaries (see Thing 14) or extreme poverty in poor countries (see Thing 3) – are really inevitable, given (selfish and rational) human nature and the need to reward people according to their productive contributions. ‘In other words, economics has been worse than irrelevant. Economics, as it has been practised in the last three decades, has been positively harmful for most people. ‘If economics is as bad as I say it is, what am I doing working as an economist? If irrelevance is the most benign social consequence of my professional actions and harm the more likely one, should I not change my profession to something or socially beneficial, such as electronic engineering or plumbing? 1) We should not abandon capitalism, per se, only ‘end our love-affair with unrestrained free-market capitalism, and install a better-regulated variety’. The book ends with a Notes section (annotated references, handy for doubters who wish to check the facts) and an Index. Finally, I cannot ignore the topic of Brexit, an event presumably unforeseen by Chang at the time he wrote the book. The EU has its problems, but the prospect of an unconstrained UK led by gung-ho free-market ideologues is horrific. 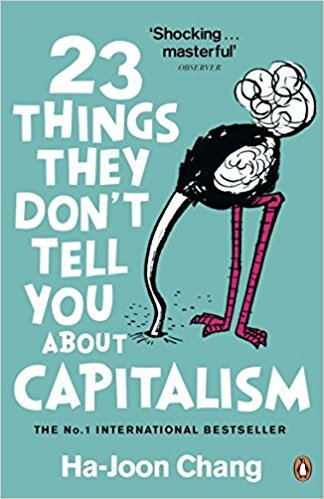 Far from being out of date, then, 23 Things They Don’t Tell You About Capitalism is perhaps more relevant than ever. If you haven’t already read it, please do so, and recommend it to a capitalist of your acquaintance, while being careful not to hint at what might be described as the ‘Trojan Horse’ nature of this collection of well-referenced essays. With the biosphere now threatened by free-market capitalism’s depredations, we must act tactically in what is now a battle for the survival of many species as well as for the lives and wellbeing of billions of human beings. By all means, aux armes, citoyens, but let these be cleverly deployed metaphorical ones. We can no longer afford the luxury of indulging in the warm feeling which comes from simply reinforcing our tribal identities. Thank you for an interesting review. That you included the following sentence “Do I have any criticisms? Yes, I believe there is a significant omission: a discussion of the role of the way that money is created in causing economic problems. (See http://positivemoney.org/ for more on this. )” made my day and is exactly the criticism I was about to post. Almost every article talking about almost any topic should included this caveat – in my humble opinion! Thanks, Mike! Yes, it’s an alarmingly neglected topic in my opinion. Nothing about the open conspiracy of globalism and the New World Order who use both communism and corporatism? Oh. Does this involve chem trails? That’s practically an independence manifesto written right there! Yes, exactly! This is also a major theme of Davod Erdal’s book, which is fascinating and inspiring reading. Thank you for a really interesting article. I look forward to following up some of the references. I was also very interested in an economist on ‘The Start of the Week’ yesterday, 5th February, on Radio 4. Catch up on iplayer at 24 minutes. (Mind you the whole programme is good). She is Diane Coyle and her point was all about how GDP is an unsuitable measure for any economy. Yes, I heard that to, Lorna. Bill Wilson and I wrote about GDP’s shortcomings a while ago (see the article titled ‘Is more GDP good?’ in this issue of SLR: http://www.scottishleftreview.org/wp-content/uploads/2012/05/slri45.pdf) and I am impressed by Oxfam’s Humankind Index (http://www.scottishleftreview.org/article/better-not-bigger/). I meant to write ‘I heard that too’ not ‘I heard that to’, and in a previous comment, ‘David Erdal’, not ‘Davod Erdal’! Capitalist Civilisation is now teetering on the brink of collapse. It will be brought down climate change and will take hundreds of thousands of species with it. Keep an eye on Cape Town in the coming weeks. It is very close to running out of water. If there’s no rain in the next few weeks they will have to evacuate 3 million people. I agree that 23 Things is a pretty good book. However, I would probably cast neoclassical economics as an ideological project, intended to bring about certain policies and practices and based on partially hidden values and agendas, associated with a characteristic psychological pathology, rather than a genuine attempt to study and understand the world. Having recently followed some of the discussions around challenging the primacy of measuring Gross Domestic Product as an indicator of national health, it appears that the same people and organisations that promoted neoclassical economics are trying to infiltrate movements that challenge or break away from the discredited models. For example, Legatum, which publishes a supposedly scholarly prosperity index (they were unable to contain their hatred of Hugo Chavez on their website and are apparently under investigation for links to Brexit); or things like ex-JP Morgan bankers sitting on sustainable development boards. which needed a back-up plan to secretly nudge events back on course to match (benevolent) predictions. The concern must be that promoters of a modernised version of the war-of-all-against all are (necessarily secretly) planning a future where not everybody is invited. I have heard academics from this milieu recant in the past (one citing mental illness at the time), but perhaps we need whistleblowers from the inner sanctum rather than just ‘trusted communicators’. In case you think I am overstating, Steve Keen’s Debunking Economics has a description of the way in which economic students are taught in stages, where later years’ course content contradicts the earlier. Apparently this kind of mystery tour appeals to people who become freemasons; it wouldn’t surprise me if some economics schools worked on similar principles. Some of the super rich are buying ranches in Patagonia or farms in New Zealand. They see the Southern Hemisphere as the safest option if Capitalist Civilisation collapses due to climate change. Capitalists and their ideologues often quote (yawn) ‘Survival of the fittest’ and game theory to intellectualy justify what is, in essence, the naked pursuit of the continuation of privilege and power by the privileged and powerful. Scientifically, it’s just not true. There is nothing ‘natural’ or ‘inevitable’ about a social and economic system that looks after the interest of a tiny minority absolutely marvelously, but considers the interests of the world’s majority not at all, or simply as a by-product of total spectrum dominance for neo-liberal ideology. Unfortunately for the capitalists and their ideologues, a close and balanced reading of the findings of modern evolutonary biology, game theory and neuroscience reveals a rather different picture than they would have you believe. Co-operation, empathy and alrtuism are as evolutionarily ‘hardwired’ into the human psyche as selfishness and competition…and the kind of societies we build will determine what capacities come to the fore, in average, in human beings. What game theory, genetics and evolutionary science has to say about the human condition is actually enormously good news for those of us who want to build a post-capitalist, post-scarcity, mass democratic society. It’s been a big problem for the left, however, in recognising this, and then using this information to our own advantage. Much of the left continues to be mired in the old nature vs nurture dichtotomies of the nineteen seventies and eighties. I still find people who quite happily accept that genes affect the body, but only from the neck downwards – the brain is only a ‘blank slate’ awaiting ‘social construction’ by society. The hard scientific reality – backed by such an inordinate amount of evidence that it’s almost embarrassing to find you still have to argue this stuff with some people – is that humans are both socially and biologically constructed…and that when that very careful user of words, Karl Marx, asserted that humans were ‘literally, a political animal’, he did not waste a single word. And while most on the left are very aware of the social contructivist side of Marxism, ‘conditions determine consciousness’ etc, there are relatively few who are aware that Marx was very clear that human beings also had what he called ‘species being’. And its not just an arithmetical case that modern science puts forward: that this percentage of the human persona (collectively or individually) is socially constructed, and this percentage is what is biologically innate. Rather it is there is an ongoing complex interaction and development between the two. Tragically, much of the left has spent so much time fighting the spurious straw man of ‘biological determinism’, that it has missed just how much the findings of biology support it’s case that there can – and should – be a better way of organising society. ” Asked if a #MeToo transformation has done a approach to Silicon Valley yet, Chang forked to total like Ellen Pao, who sued her try collateral organisation behind in 2012 for gender discrimination, and program operative Susan Fowler, who spoke out about passionate nuisance during Uber. “She (Ellen Pao) mislaid in 2015, though she arrange of won in a justice of open opinion and that non-stop a doorway for some-more women to come brazen though it didn’t occur right away,” Chang said.